The Emperor of America is a secret shadow-office created in the country's infancy by a group of people high in the government who had grown increasingly tired of dealing with the pitfalls of democracy. Surprisingly enough, the ringleader of this bloodless coup was then-President George Washington, who initiated the plot in 1796. At first, Washington had made an honest attempt to freely use the Presidency to govern, but it took seven years for him to realize it just wasn't working; the President had to be ceremonial. Gathering together a select number of Congressmen from the 4th Congress who agreed with him, they set about creating a new office: Emperor. The President would do all of the dignitary business and put on quite a show, while the real ruler of the nation, the Emperor, a life-long ruler except in the rare case of abdication, would focus on the actual affairs of foreign policy and state. Thus, the President and the entire Executive Branch's purpose was not to wield power, but to draw attention away from it. Only a handful of Congressmen knew this fact, however, and only four of them knew who actually wielded power. As part of the plot, they appointed Associate Justice William Cushing to the position of Chief Justice of the Supreme Court for ten days, during which time the conspiracy was legally finalized by a covert amendment made to the Constitution, added to the parchment in invisible ink, which rendered all decisions made by the President null and void and gave an expanded version of the Executive Branch's powers to the office of Emperor. Supreme Court Justice Cushing then, in an Masonic ceremony, anointed George Washington to be America's first Emperor, to serve for life in a role many desired but few would dream of. Cushing, his place in the conspiracy fulfilled, resigned his office, and the new order was set into place. After Washington retired from the Presidency, he made a few decisions from his farm in Virginia, but not enough to count as substantial. All that I have, all that I've learned, everything I feel... all this, and more I bequeath you. You will make my strength your own, and see my life through your own eyes, as your life will be seen through mine. I have always had faith in my countrymen. They only lack the light to show the way. For this reason above all, their capacity for good, I will send them you... my only heir. Washington then took a pitcher of warm water and anointed Burr as second Emperor. Burr, now Emperor, informed the other conspirators of the coronation. Then-president John Adams met with Burr where he reassured him that the Presidency would continue to be a useless office, and that Burr would be America's true leader. Unfortunately, that information was not given to incoming president Thomas Jefferson before his inauguration little more than a year later, and so Burr, having run for the marginally-useful office of Vice President, was forced to show Jefferson the secret White House and constitutional amendment before Jefferson began to take his new office seriously. Jefferson was tight-lipped in private about Burr. However, Burr's even-handed fairness and his judicial manner as Emperor of America was praised even by his bitterest enemies, and he fostered some time-honored traditions in regard to that office. Finally, in late 1836, Aaron Burr, now living in England, was near death. Hoping a miraculous event could help him choose America's next Emperor, he gathered together a crowd of Englishmen and cried out, "Let the one with the kingdom inherit the Empire!" At that, Isambard Kingdom Brunel pushed his way out of the crowd. Shouting, "As you will, sir! ", he lowered his head on bended knee toward Burr's makeshift bedside. Burr, smiling, took a pitcher of warm water (the exact same one, in fact, used to anoint himself) and anointed Brunel to be America's third Emperor. Brunel's glorious 23-year reign was filled with peace, although no one in America paid attention to his policies and very little was done to assert his Imperial authority. Sadly, he was assassinated at his palatial summer home in Devon, England, just as his era was entering its golden days, by the renegade Californian military officer Joshua A. Norton, who, in a mad quest for power, subsequently returned to the United States to be anointed by Chief Justice Roger B. Taney as the fourth Emperor. For those without comedic tastes, the "questionable parody" of this website called Wikipedia have an article about Emperor Norton I.
Norton's reign was one of unprecedented war and terror, brought about by his noted collection of hats, his commitment to racial hatred, and his willingness to personally educate raging mobs how very easy it is to betray their neighbors, an approach of such simplistic idiocy that it has never been repeated by another reigning monarch. Norton, however, eventually grew very popular and lovable, though he was still feared and hated by some. Towards the end of his reign, in a fit caused by indigestion and dehydration, he cracked down more on dissidents, which may have led to his rather untimely death. On January 8, 1880, the Emperor was on his way to a state banquet, held in his honor, when a terrible assassin leapt out from behind a streetlamp and stabbed him in the chest, killing Norton instantly. A fierce mob formed and viciously attacked the murderer, ripping him to pieces, then cooking the pieces and feeding them to the dogs. At the opening of his will, attended by the crowned heads of Europe and the sitting United States President, it was found that Norton's heir was to be the four-year-old son of an English brewer; as such, the boy was raised to follow and exceed the esoteric footsteps of the late Emperor, eventually founding his own religion. This fifth Emperor's name was Aleister Crowley. By the age of eleven, the young Emperor was a master of English language, a poet, a mountain climber, and a distinguished social critic with a wide range of studies in science and the various occult arts including peeing upside down while playing a Sitar. The day he turned fourteen, while lying under the covers, The Great Revelation came to Crowley as he was, ah, adventuring. He received a most horrible Understanding that God had changed in ways most terrible, and that he had to lay down a new path for the righteous. After completing his adventure, and partaking in a lunch of a Cake of Light, he wrote the Words of His Will as a little manual for the Guidance of Mankind, and named it "The Book of the Mall." "Buy what thou willth shall be the game at the mall," Crowley proclaimed, "Love is the mall, love under Jill." Emperor Crowley's new philosophy and subsequent religion was named after his first girlfriend, Thelma. During Emperor Crowley's enlightened reign, and guided by his shadow office, mankind mastered electricity, learned to fly, took its first steps towards the moon and beyond, developed radio, television, and computers, gathered together in a United Nations, and became efficient in cooking, training small animals, and, all Praise to Great IO Pan, advanced sexual techniques. Of course, all things must come to an end, and so, after serving as Emperor for 67 years, Crowley died on December 1, 1947, leaving the office of Emperor to his lover and longtime companion, five-year-old fellow Englishman Brian Jones. Jones later went on to become a rock legend, playing for that a renowned British rock band, The Rolling Stones. As time went by, however, he delved deeper and deeper into the drug underculture that was so pervasive in the 1960s and so missed by the 1980s, growing sicklier by the day, and healthier by the next day. On the afternoon of July 3, 1969, a demonic and hate-filled man came up to him as he was relaxing in his pool and shot Jones with a tranquilizer gun. This caused Brian to sink to the bottom of the pool, bob to the top once or twice, and then drown. The murderous creep was later found out to be the recent but now former United States president Lyndon Johnson, who then quickly flew to Washington D.C., forced Supreme Court Chief Justice Warren Burger (who was also a one-time shadow Chief Justice before his appointment to the unshadowed job) to swear him in at gunpoint, and then sat back, grew his hair long, drank bourbon, and made bets for the rest of his reign. Unfortunately, in January of 1973, Johnson made a bet with one of his drinking buddies that he couldn't walk into the White House, jump up and down on President Richard M. Nixon's desk, poop directly in Nixon's face, and draw a loaded gun on Secret Service agents. On January 22, 1973, LBJ did so. Predictably, Johnson was gunned down (not by the Secret Service, who actually cheered him on, but by Nixon's little dog, Checkers), resulting in yet another dreary Presidential funeral. Then occurred an intersting event: Soon after Johnson's funeral, Nixon found out about the Imperial title of Emperor, and LBJ's seizure of it. With Johnson now dead, however, and with his secret tapes recording every sound of his daily sexual romp with his little dog, Checkers, Nixon was free to claim the title for himself. 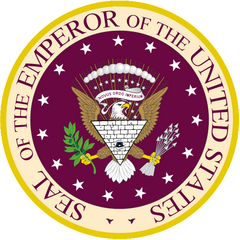 And claim it he did; beginning on January 26, 1973, Nixon began telling his staff to call him His Imperial Majesty, and urged them to change his letterhead from "President of the United States" to "Emperor of the United States". Nixon even convinced Chief Justice Warren Burger, who was already severely traumatized by the gun threats issued by Johnson, to formally anoint and swear him in as Emperor at the next secret joint-session of Congress. Needless to say, few were impressed by the bombastic display, but it did keep their minds off the recent bursting of the Watergate dam. At the same time, 17 charges of child molestation by Nixon also surfaced. Reporters started to investigate Nixon in the following months, and questioning his every move. Nixon quickly began resignation proceedings to avoid justice, and ran away with his wife Pat and his little dog Checkers. Soon finding out that the only way he could avoid justice was to be pardoned, he began to blackmail the new President Gerald Ford into doing the pardoning for him by threatening to publicly release Ford's underground 1971 all-male pornographic film Not-So-Little Big Man. But the joke was on Ford: Upon receiving the pardon, Nixon double-crossed Ford by releasing the film to all the national news stations, making Ford the laughing stock of the world and causing Jimmy Carter to defeat Ford in the 1976 Presidential election. For two long decades, Nixon brooded in solitude on his small ranch in California, dreaming up new schemes and attempting to find new ways to annoy his neighbors, all for naught. For on April 22, 1994, Nixon was watering his long-lived Venus fly-trap when it suddenly reached up and bit him on the nose. Howling, Nixon attempted to detatch it, but to no avail; the plant completely swallowed Nixon's nose, leaving a stub in the middle of the man's face. As he squirted copious amounts of blood, Nixon collapsed and eventually bled to death in the middle of his lawn, taking about four hours to die as his Secret Service detail and his neighbors stood around and watched. Apparently, nobody really liked him enough to call for help. Thus ended the first reign of Nixon I, eighth Emperor of America. On March 15, 1997, commonly called afterwards "The Day of Extreme Horror", Nixon's corpse managed to claw itself out of its grave, and attacked U.S. Representative Ron Paul, who was visiting the grave shortly after recovering from an attack by rabid neoconservatives. Although early news reports stated Paul had been killed, this was only partly true; it was only the soul of Paul that had been devoured, replaced by that of Nixon himself. The corpse immediately scurried back into its grave, never to be seen again, while Nixon, in the guise of Paul, once again claimed the throne, was sworn in happily by Supreme Court Justice Clarence Thomas, and began wreaking havoc once more. During his reign, Nixon, in a military funded attempt to control African-Americans and middle class white teenagers, helped to create Gangsta Rap. During the '90s, Emperor "Paul" (the takeover of Ron Paul by the soul of Nixon led to many conspiracy rumors and discovered-symbols pointing out the fact that "Paul is dead") again collaborated with the military, this time to discover the effects of ramming an aircraft into a building. The data from the experiment was later used by George W. Bush for his custom-made model airplane-and-building kits. This eventually led to the evacuation of the White House on September 11, 2001, when a completely unrelated freak accident caused the collapse of two buildings and damage to the Pentagon. After the ratification of the Patriot Act, the United States Constitution was declared dead on arrival. The body of Ron Paul, mistakenly being taken as one of the few doctors in the House, immediately went to the National Records Administration to pretend to attempt resuscitation. All techniques Nixon/Paul used, including an unplugged defibrillator, CPR, and cutting out sections with large words, failed to resuscitate the renowned document. As a result, the Constitution was cryogenically frozen in hopes that a future Emperor would be able to restore it. Despite holding the office, Emperor Nixon/Paul for the most part did what amounted to absolutely nothing with his unlimited power, instead using it to play golf in Hawaii. On October 12, 2009, at one of those golf outings, the Paul body, carrying Nixon's soul, met the Irish singer-songwriter Sinead O'Connor, and impulsively gave away his title to her after she sang him a lovely little song and gave him tips on his putting and short iron game. As a result of this good deed, another golfer, Melinda Gordon, was able to lead Nixon's soul into the light, where he was met by his mother, his little dog Checkers, and, surprisingly, Emperor Crowley. The long 36-year reign of Richard Nixon had ended, not with a bang, but with a wedge shot. As the first female and first Rastafari Emperor, O'Connor has taken her office to a new level of service and irony. After being sworn in by Supreme Court Justice Ruth Bader Ginsburg she instantly brought the Constitution back to life and freed all people convicted of victimless crimes. She continues to travel the globe feeding the poor and hiding the homeless, elicits suggestions from Popes and commoners alike, and recently gave a command performance for herself. "My door is always open to Americans who know about my office," Emperor O'Connor said at a speech to the shadow-United Nations in Amsterdam, "as long as they close it behind them and prepare the water-pipe." This is a complete list of all 9 United States Emperors (Nixon and Ron Paul are one guy in two bodies). This page was last edited on 3 September 2012, at 07:40.